For instance, have you ever heard these comments after you distributed your results internally? Moving from interesting but worthless results to interesting and useful results is not actually that hard. In fact, all you have to do is start with a customer satisfaction measurement approach that includes three critical elements. 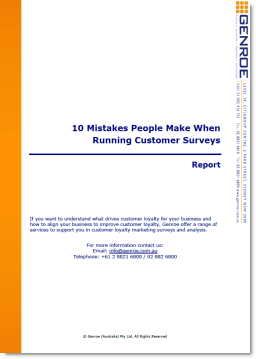 It seems odd to me that many customer loyalty surveys never ask these key questions. They ask loads of detailed questions about the colour of this and the time it took for that. The problem is that at the end of the day you need to know how much customers like you as a business and match that to customer loyalty, i.e. profit. This question has been popularised by the research done by Frederick Reicheld et. al. and the development of the Net Promoter Score. Analyzed correctly this has been shown to be a very good indicator of customer loyalty. In general my preference is to use the Net Promoter Score question as my experience indicates that customers consider a wider range of factors when scoring this question. Now that you have an overall customer loyalty measurement you need to understand what drives customer loyalty for your business. To do this you need to include a set of questions that measure your performance on the different drivers in your business. The goal here is to understand how you perform on each driver AND determine which drivers are most important. With this information and a little bit of statistical analysis (correlation and regression techniques) you can determine which elements of your business are most important in driving customer satisfaction. So with the previous two question types you know your customer loyalty level, which elements of your business drive customer loyalty and your score on each element. Okay, you’re at the final hurdle you know what is wrong and what needs fixing but how do you fix it? This is where the last element comes in: how can we improve questions. Notice both types of question are open (no scores out of 10) responses. Using them you should get some good ideas about how to improve your business. Well, now you have everything that you need to improve customer loyalty. The only thing left to do is get out and make changes to your business. Oh and then do it all over again next quarter – remember customer satisfaction is a journey, there is no perfect customer satisfaction. Well Adam, thank you very much for your worthed information that will enable me to improve CS questionnaire. However, the situation I am facing now is worse than inability to design questionnaire correctly to extract worthed feedback as you mentioned above. As an ISO9001 auditor and ISO/IEC 17025 assessor, I frequently receive CS report from organization (auditee, assessee), which most of them (95%) are public organizations. Their reports concluded that their customers are quite satisfied with the score > 7 (in a 1 – 10 scale), so that there is no need to improve performance. They received data, but they have no added-value from the survey. One of the problems hampering their creativity to improve questionnaire is the beaurocratic attitude, that is beyond my reach. They receive template (“standard”) of questionnaire from their headquarter that have to be filled in. Their objective is very simple: just to do the job, so that they will have credit for it and no punishment. Indeed, I am very curious to improve this situation, but since I am not a consultant, it is limited by assessor/auditor ethics code. By now, the best thing I can do is to keep learning about CS survey, enrichning my knowledge as by reading your inputs, until then when the opportunity come I will be ready to give worthed contribution to them. Once again Adam, thank you very much for your sharing. You bring up a common problem: customer feedback used only for compliance is not very effective. I certainly have sympathy for your situation as if the organisation is not interested in improving their business (increase revenue or decrease costs) then it’s difficult to help them.